At the State Democratic Party annual Dinner in 1984, syndicated Washington Post columnist Mary McGrory noticed a curious phenomenon: the loudest applause was for a relatively obscure local politician. At the time he was nearing the end of his politically elected career as the Middlesex County Register of Deeds, his last elected role after serving as a Medford School Committeeman and State Representative, never having been voted from office. He was also Kennedy’s campaign treasurer. When asked last year by Kerry to be his campaign treasurer, too, he accepted, becoming what is believed to be the only person to serve the same role for both U.S. Senators in the same state. Of course, with Zamparelli that means another story. Kerry and Zamparelli met in 1974 in then-Middlesex District Attorney John Droney’s office and became fast friends. Then an up-and-comer, Kerry sought Zamparelli’s advice on a run for lieutenant governor. His advice was, don’t run, but Kerry ignored him and won the seat. 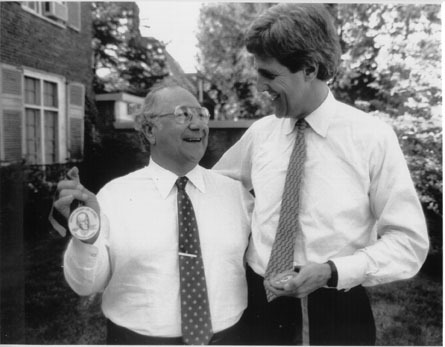 When the senate seat Kerry now holds opened, he returned to Zamparelli for advice. “Don’t run,’ he said. Kerry ignored it and won, saying sometimes you have to go against even your best advisors. Now, as rumors about Kerry’s interest in the Presidency persist, a reason Zamparelli suspects Kerry asked him to be his treasurer a year ago, Kerry said he will again seek Zamparelli’s advice. Given his track record, Zamparelli does not know if he should tell him the truth or employ some reverse psychology. Though Kerry maintains he has a senate seat to win in November, he would again seek Zamparelli’s advice on any presidential bid. In Zamparelli’s cluttered Doane Road home office, boxes are filled with old collegiate and military awards headed to display at Tisch Library on the campus of his alma mater, Tufts University. It focuses on his military service in World War II and as a V-12 military student. The exhibit opens on April 1 and runs through the summer. “I was not looking for any honors but I am happy to be honored this way,” he said. The Transcript spoke with Zamparelli amidst the boxes last week, discovering insights into the political life from start to finish, including his take on Kerry’s chances in 2004, how to say yes to Kennedy (which he did 20 years ago) and how local politics and politicians have changed over that time. The following are excerpts from the conversation. Medford Transcript: We will start with a quote from Plato. `One of the penalties for refusing to participate in politics is that you end up being governed by your inferiors.’ You’ve been involved in politics your entire life. What do you think? John Zamparelli: The quotation implies that if you refuse, you end up being governed by inferiors. Meaning that the political person is inferior, right? (Laughs) I think that by and large, in spite of the mediocrity of government, I think that there are enough good ones that we end up with quality representation. MT: Spoken as a politician. JZ: (Laughs) And I am admitting the inferiority or, at least the mediocrity of politics. MT: When did Senator Kerry tap you to be his campaign treasurer and why do you think he did. JZ: I got a call from him — let me decide what I say. He said to me, `John, would you do me the honor of being my campaign treasurer? I know you are Teddy’s treasurer but I would like you to be mine.’ I was surprised. Normally, and I don’t mind telling you this, I would have cleared it with Kennedy first. In this instance, I accepted. And in the event, and I didn’t say this, but in the further event that Senator Kennedy didn’t like it, then I would have to resign from Kennedy’s, not from Kerry’s. I felt that Kerry put himself in a funny position, so I accepted. MT: Almost like he was on bended-knee, like he compromised himself? JZ: No. The point is there is a limit. He is a United States Senator and I don’t think I’m that important. To say `I’ll think it over’ would be an insult. To say I will clear it with Kennedy is in some circumstances, okay. In this case I accepted and I think the reason why is that he is looking ahead. MT: How much of that do you have happen -father and son relationships when you came up with someone’s father and his son comes along? You have some strange connections in politics. JZ: A few. It’s (father-son) not as common politically, but, for instance, everyone knows (late US Congressman) Joe Moakley. Joe and I served together in the legislature. But what is my relationship with Joe? I dated his wife before he married her. We were both single, right? MT: What are some of the things you don’t like about politics? JZ: For instance, I refused to go to Tufts (March 13). I was invited by President Clinton. I don’t care about his sexual activities. That is his life and his business and I don’t try to judge him on pardons except he pardoned a man (tax evader Marc Rich) that owed us $36 million. That smacks of illegality, though there is no proof to it. And I will not have anything to do with him since. Even though Kennedy is close to him, even though I like Hillary. Even though you will come in my family room and see pictures of them with my family. Mr. (President Jimmy) Carter, my children went to Carter’s children’s birthday party at the White House, and they will never forget it. I liked him and his wife, but I won’t donate a dime to any of his causes for what he did to the kids of America. He had an international relations problem with Russia, he cancelled the Olympics. I have never been good enough to be in the Olympics, but I know people (his late older brother, Andrew “Hawk” Zamparelli) who have worked their heart out. The answer they gave is that they can go next time. How many people can have that peak for eight years? The real good ones, maybe, but you and I both know if you make it that once, that’s it. Those were honors that I loved being there in that small clique, but I want nothing to do with that. MT: How many times has it been like that, when you refused? Turned your back on someone? JZ: Nothing that Tip O’Neill has done would make me turn my back on him. I’ve never read anything bad that he has done. We all make bad judgments sometimes and I am the last one in the world to judge. I have made a ton of political errors. I tell young people `Don’t worry about errors you make in politics if you are ambitious politically.’ The public will forgive you provided you admit your mistakes and you correct them if you can. MT: That is every politician right there. Deny your mistakes first, apologize later. JZ: I didn’t. I admitted my mistakes. MT: The highest office you ran for was? JZ: I ran for District Attorney and lost in 1956, and I’m not a perennial. Therefore, I practiced law from 1956 to 1969, made some money. Did I run again? Only once more for D.A. That is when John Droney was appointed District Attorney, he was the assistant District Attorney at the time and I ran that once and John beat me, and I never ran again. John and I became friends after 13 months of not talking to each other. MT: There is probably a lot of that. If the opponent is worthy enough then you will come back together and respect him as a man. JZ: If your fight was really filthy, you will never make up. In my case, I kicked the s- out of him when he was present. But when his wife and daughter were in the audience, I didn’t treat him badly. In other words I had a respect for his wife and kids. MT: There was a line you would not cross. JZ: In Cambridge, when they were there, I wouldn’t cross that line. In Waltham, though, he was starting to leave. `Don’t leave,” I said. I was going to challenge him. I wanted him there when I was challenging him. MT: How did you get appointed as treasurer for Ted Kennedy? JZ: To be frank, I don’t know. I got a call directly from Ted. He said, `I would like you to be my treasurer. Do you want to think about it?’ I thought that was unfair. I said I didn’t have to think about it. I accept. I get a call from Ed Martin, his former chief of staff; he said `How the hell did you know about the Kennedy reply?’ I asked what he was talking about. He said, `Normally, I get to call people, but on something personal, they – Jack, Bobby – all of them handle it themselves. Do you know what would have happened if you thought it over?’ I said, “No,” and he said you would never get a call back. If you have to think it over, they don’t want you. MT: In your experience, what is the biggest difference in politics then and now? JZ: I think there was a closer relationship in the old days. After meetings do you know we used to all go out — Republicans and Democrats, men and women. The point is that we would all go out. Today it is more personal, more spiteful. More get even. Advertising copy for the profitable hotel conglomerate.